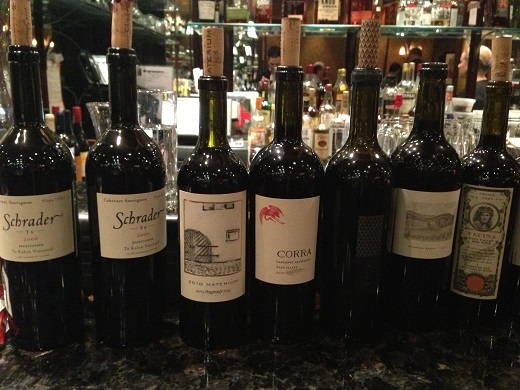 I was thrilled to join the Cabernet Lovers of New York City earlier this year for a casual, informal dinner with some of our favorite Napa Valley Cabernets. For the most part, the wines showed brilliantly, and highlighted the diversity Napa Valley is capable of. North Square, which is located in the Washington Square Hotel in Greenwich Village, did a great job with our dinner, even though wine was the clear focus. The menu was beautifully prepared, with simple yet pure flavors that allowed the wines to shine. Staglin’s 1995 Cabernet Sauvignon was the first memorable wine of the night. Totally graceful and silky on the palate, it graced the palate with a super-classic if somewhat Left Bank-inflected array of tobacco, cedar and graphite before brightening up a bit in the glass with plum and raspberry notes. Overall, the 1995 delivered a great performance for a wine that is close to being fully mature. The 1995 is a great choice for drinking today. Sadly, our bottle of Dunn’s 1995 Cabernet Sauvignon Howell Mountain was corked. We had better luck with the 1995 Lewis Cabernet Sauvignon Reserve, a wine built on serious depth, concentration and textural richness. A showy pliant Cabernet, I have no doubt the 1995 was more attractive when it was younger. I didn’t quite find the subtlety or complexity I expect in an 18 year old Napa Valley Cabernet Sauvignon, but the competition was pretty intense on this night. Two Cabernets from Philip Togni, both from my cellar, were simply extraordinary. The 1994 Cabernet Sauvignon was a model of total finesse and class. Grilled herbs, smoke, tobacco and new leather led to a core of richly layered, delineated fruit. Togni’s 1997 Cabernet Sauvignon presented a pretty similar profile, but with more textural richness and volume and fewer of the savory notes found in the 1994. Most people preferred the 1997, and I have to agree. The 1994 would have been the best wine on the table virtually in any other dinner, but then the 1997 arrived and conquered the heart, intellect and palate with its superb balance and overall sense of harmony. What a wine! Verite’s 1999 La Joie, a Cabernet Sauvignon/Merlot blend mostly from Sonoma, showed well, especially in this context, mostly for its textural silkiness and balance. Sweet tobacco and expressive red fruits lingered on the close. The 2001 BOND Vecina was totally vivid and alive, with a kaleidoscope of dark, earthy aromas and flavors. Smoke, tar, licorice and dark red fruit all swirled around the glass in a young, powerful wine that will drink well for another decade. Abreu’s 2001 Madrona Ranch took us into the stratosphere with its super-expressive dark red fruit, floral aromatics and stunning overall balance. There are few Napa Valley Cabernets I would rather drink than those of David Abreu and Brad Grimes. I have been lucky to have the 2001 a number of times. It has never been anything less than stellar. I was very happy to have another chance to taste Maybach’s 2010 Cabernet Sauvignon Materium, which was impressive from barrel, but much less interesting in finished form, either because it was still recovering from bottling or just the victim of a bad cork. Regardless, on this night, the 2010 Materium impressed with an exciting melange of dark, mineral-inflected fruit. Sweet spiced notes, lavender and pencil shavings linger on the tense, pulsating finish. Sadly, we had an off bottle of Celia Welch’s 2007 Corra Cabernet Sauvignon. It happens. Schrader’s 2006 and 2007 Cabernet Sauvignon Beckstoffer To Kalon T6, also from my cellar, were showstoppers. I preferred the 2006 for its explosive, vibrant personality, sumptuous fruit and exceptional pedigree. The 2006 was flat-out breathtaking. Wow. The 2007, on the other hand, was voluptuous, racy and exotic, with seamless, silky tannins and fabulous balance. I found it a bit heavy next to the 2006, but that is splitting hairs at this level. I also adored the 2009 Rivers-Marie Cabernet Sauvignon Roberto Corona Vineyard, from Thomas Rivers Brown (who also makes Maybach and Schrader) a wine that has been beautiful since the very beginning. It was once again stellar on this night, with endless layers of fruit and a generous, resonant personality that makes for great near and medium-term drinking. I would like to thank the Cabernet Lovers of New York City and Mike Pobega in particular for organizing this fabulous dinner. Wine can be such a positive force of connectivity among people, as it was once again on this evening.